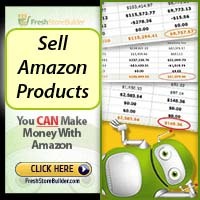 Fresh Store Builder (FSB) is an e-commerce software that allows you to create a website to sell products from Amazon.com. We use FSB on several websites. The software functions similar to WordPress and there is a supplemental WordPress plugin available for purchase. Display: Nice clean display of products. Seriously, everything is lined up nicely from listing products in a row, to descriptions, to shopping buttons. Makes a very nice, smooth, user and visitor experience. Stand Alone: Does not rely on any other software. Runs outside of WordPress so there is no impact on your WordPress site, no stress on the WP database or WP page load time. Other Vendors: Create custom URLs to create “Buy Now” links to other products on the Web, outside of Amazon.com. You might use this feature to link to products on Commission Junction, Share-a-Sale, Click-Bank, etc. Unique Search Results: Search box feature that pulls products from Amazon into the search results if a user looks for something you have not yet listed. Spin Options: Comes with a feature to spin text (which means creating a sentence with alternative words) to assist you in ranking higher and avoiding duplicate content penalties by Google. Seasonal Offers: Use the Hide or Disable features for products, sideboxes, and widgets to promote seasonal items. Community help: TWO community forums to ask questions, search for past discussions, and browse user’s sites for ideas to improve your own income. This is actually more important than one initially thinks. It’s very nice to run a search for your problem or ask fellow users, than to wait 24 hours for a submitted tech ticket. Booster Plugin: Optional affordable booster plugin for those who wish to integrate products with WordPress posts and pages. Cons – What’s not to Like? Amazon only for Add to Cart: The store is only for Amazon products, so if you have your own products, you will need to look into how to list them on Amazon for sale through Amazon seller programs, such as Fullfilled by Amazon (FBA), or use the Buy Now button option with a Custom URL. Limited Web Design Options: Unless you know coding, your store will have a similar layout to all other FSB stores because there are only so many “templates” to choose from. Also, WordPress users should understand that while you can use the CSS settings to modify the color and layout of your Fresh Store, you most likely will not be able to match it exactly to a WordPress theme. You cannot purchase this WordPress Plugin as a stand alone software. You must purchase FSB for the plugin to function. The plugin allows you to show your FSB store categories, products and shopping cart contents inside WordPress by using Widgets or embedding into Posts and Pages. This is perfect for integrating a smooth transition from WordPress to your FSB software. Great – You installed the software. Now what? Navigation: Set your top and bottom navigation links at Template > Template Options. Sidebar: At Content > Add Sidebox, you can choose some sideboxes to add such as Search, Shopping cart, custom HTML, etc. Also under Content are options to re-arrange your sidebar boxes. Widgets: Visit Content > Add Widget to add widgets of BestSellers, Random Products, Sliders, Special Offers, or custom HTML. Note: To edit a custom HTML widget, you go to Template >Template Options and the widgets are toward the middle of the item list. Social Links: Add links to your social networks: Template > Template Options > Template Options … scroll toward the bottom for Facebook, Twitter, Pinterest, YouTube, and Google Plus options. Decide on Tag Use: Go to Tools > Change Parameters > Product Tags and choose your Tag settings. You can choose how many tags to set for each product imported, turn the import feature off to add your own tags, etc. Decide on Add to Cart Options: You can use only Add to Cart, only Buy Now, or a mixture of both buttons. To show only Buy Now buttons, look in two locations. Go to Tools > Change Parameters > Cart & Checkout will let you hide Add to Cart button on all product pages. In the same location, but under Products, you’ll find the option to turn on the display for a direct link to Amazon on the Product page. SEO your Categories and Products: Go back to your Product and Category section of the dashboard and choose View All Products and View All Categories, respectively. For each category and product, click Edit and create unique text descriptions. Check the SEO & Meta to be sure it is acceptable to you. For example, you might shorten the URL, remove words people don’t search for, or replace that URL with keywords of your ow. Go Live: Under Get Started > Store Health you can make your store live. Test Run: Open another browser where you are not logged in and click around your store. Click all the way through a product until you arrive at Amazon. Make adjustments if needed. Promote: Begin normal Internet Marketing steps such as scheduling products etc. For the best social media scheduler see our post here. Hide – Products that are hidden give a 404 error if it receives any visit. Keep them in your store if you don’t want the system to add them in again when you use autoposting. Keep in mind, there is no way to retrieve a product once it’s hidden. Queue – This term is used in two ways. Under Parameters, you have a Product Queue where you can set the number of products to add each time the Queue runs. This is used for populating or autoposting products. The second type of Queue is used to edit a group of items and referred to as a Queue Run (Product Edit Queue > Queue Run). It allows you to place items in a “group” or queue and make edits to each one. This is really helpful if you think of outsourcing a task or if you are working on mass edits across your sites as it will keep track of your last item edited so you don’t have to do it all in one sitting. SEO – best practices, keep a good ratio of unique content vs FSB products. Also, add some CSS and unique content – anything to make it look less like a template so Google doesn’t think you store is just like all the rest!